The lens has been developed with the company’s unique insight from having designed and produced sensors. The optical design is said to be optimized for high resolution and sharpness, while at the same time offering smooth transitions to out-of-focus areas. To that end, the new model adopts 11 elements in 8 groups, using a mix of exotic aspherical and ED glass types. The new lens also features Sony’s Nano AR coating for improved contrast and color in tricky lighting. Designed to appeal to both still photographers and videographers, Sony’s innovative linear SSM is employed for fast and quiet autofocus operation. Externally, the lens has more controls than is usually found on FE models, and includes both focus and aperture colors (the latter with a de-clicking option for quieter operation during video capture) and a focus-hold button. Other features of note include an 11-bladed diaphragm, dust and moisture seals, and a minimum focus distance of 2.62’ (80cm). With a 77 mm accessory thread, and measuring 3.52 x 4.23” (89.5 x 107.5mm), the lens is similar in size to DSLR models. It is also pretty heavy and weighs in at 1.80 lbs (820g). 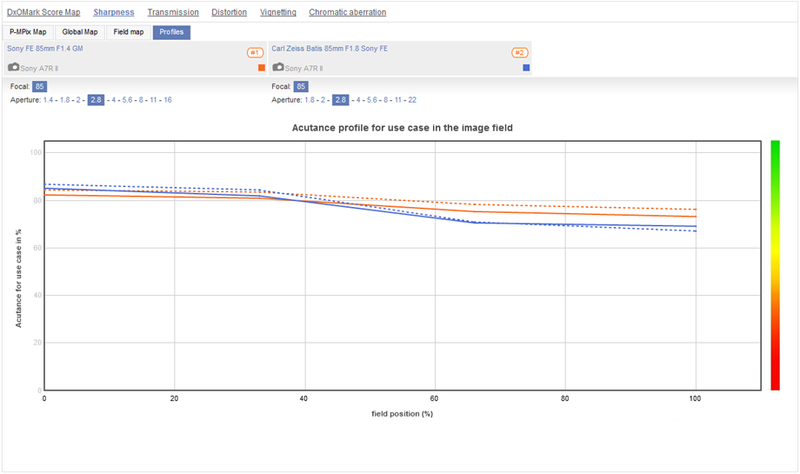 We’ve analyzed the lens on the second generation full-frame 42-Mpix Sony A7 R II, and are delighted to share the results. 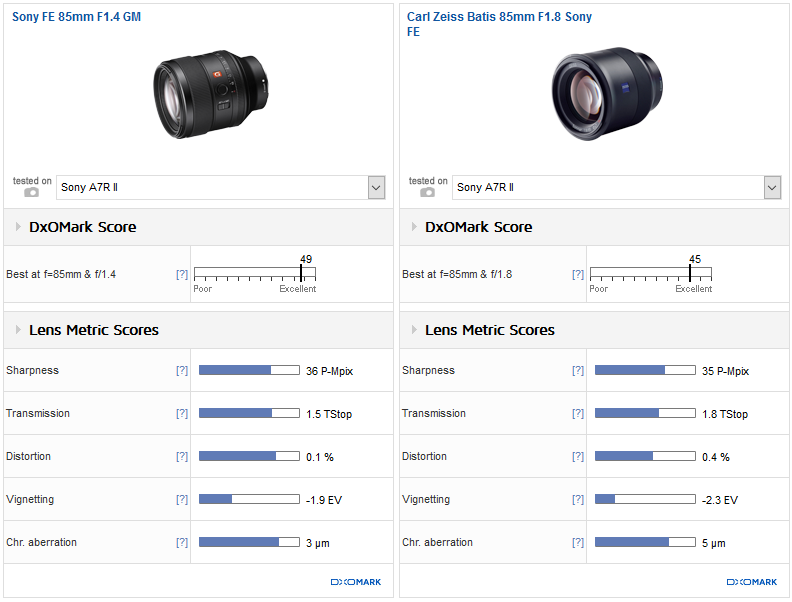 When tested on the full-frame 42-Mpix Sony A7R II body, the new 85mm achieved an excellent overall score of 49 (2nd place in the DxOMark lens database). Individual metrics were of course very high, with the lens attaining outstanding results for sharpness and control of distortion, lateral chromatic aberration, and vignetting. Optimum performance across the image field is achieved at f/5.6, but performance is also excellent when opened up one or two stops. At the initial aperture, the lens remains a very good performer and it has exceptionally high central sharpness by f/2, though there’s noticeable astigmatism at that aperture in the outer field — no doubt lending some character to images. Of particular interest to users is the exceptionally low lateral chromatic aberration: images look very clean, even shot wide open. If you’re considering the Sony, you’ll probably want to know how the Zeiss Batis compares — it is, after all, some $600 cheaper. Like the Sony, the Zeiss is an autofocus model, and while slower at f/1.8, there are few if any real compromises in build or in image quality that camera makers usually make. 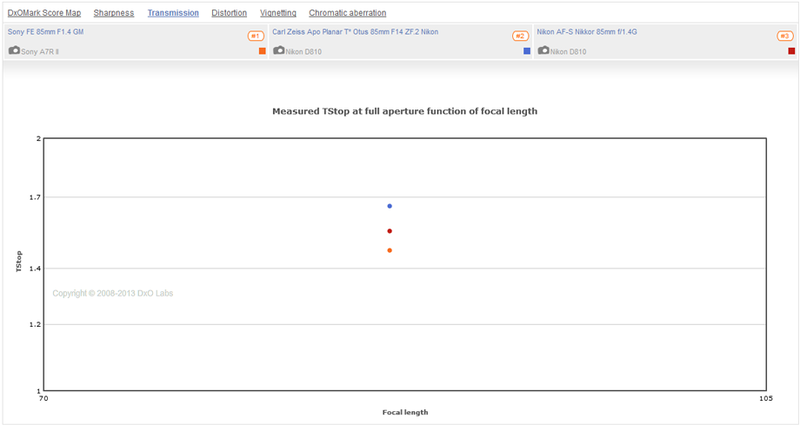 It has similar peak sharpness levels and similar sharpness at corresponding apertures. However, if we’re being picky, the Sony has marginally better sharpness in the outer field, and that sharpness is more consistent and more homogenous across the frame. Both lenses have similarly low levels of chromatic aberration: the Zeiss is excellent in the centers, but it peaks a little higher than the Sony in the corners. The Sony also impresses with its lower vignetting: it has far lower visual weighting in the corners than the Zeiss wide open, and it has much lower distortion — by comparison, the Zeiss Batis has noticeable pincushion. Though the Zeiss Batis performs well — very well, in fact, everyone knows that the $4500, 11-element Otus is the firm’s best-performing model, and as a f/1.4 it’s directly comparable with the new Sony. The Otus is not made with a Sony FE mount, so we’ve tested that lens on the formidable 36-Mpix Nikon D810. So it comes as something of surprise to find that the Otus and Sony perform at similar levels. 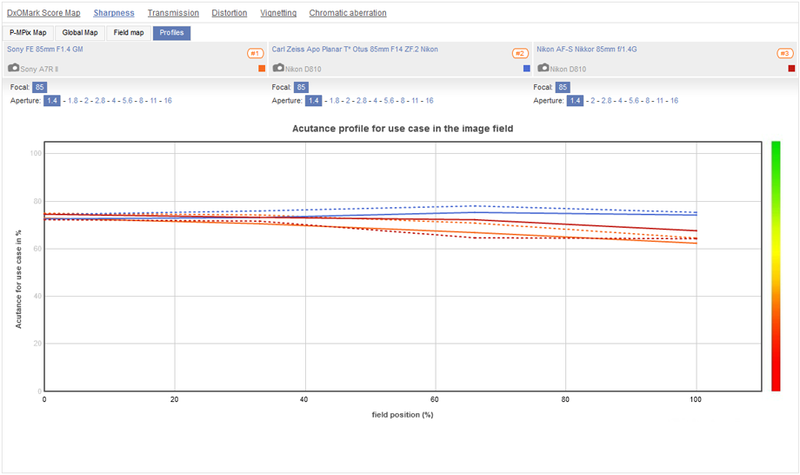 As you might expect, however, there are some differences in the way the two perform, given that the A7R II has a potential advantage in our sharpness scores due to the slight increase in pixel count. 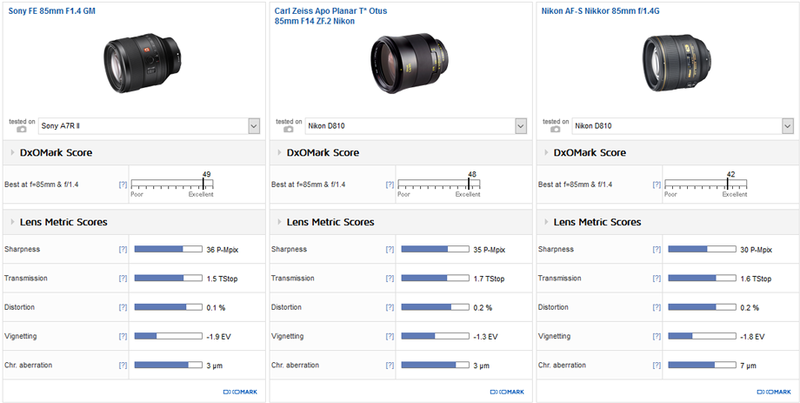 We’ve also compared the Sony lens with the equivalent 10-element Nikkor. It is closest in price to the Sony and it performs superbly, despite lacking ED glass and aspherical elements. Wide-open, all three share similar sharpness levels in the center, but only the Otus maintains that sharpness across the field to the corners. While all three show some astigmatism, the Sony and Nikkor share slightly higher levels at wider apertures, though the Nikkor never really eliminates it until f/11. Stopped down, the Sony and Otus are pretty much equal in sharpness, with the Otus ahead in symmetry and control of chromatic aberration. Sony matches the Otus in peak levels of chromatic aberration (both measured at 3 microns max). 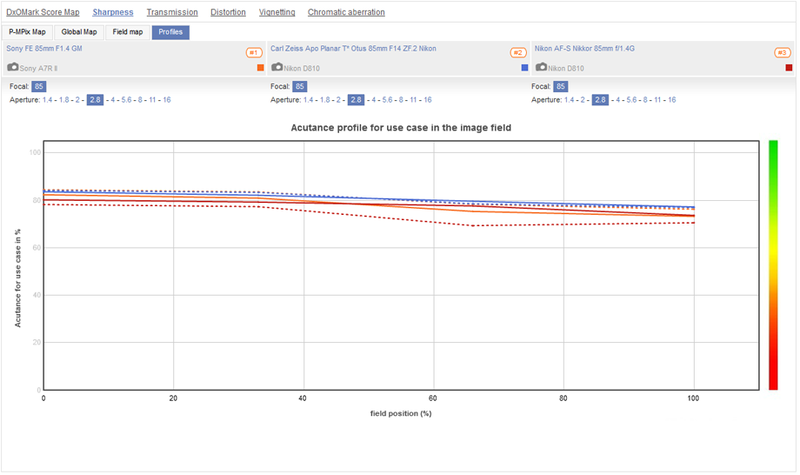 And both have noticeably lower fringing than the Nikkor, even though anything under 10 microns is considered low. Where the Sony has a distinct advantage over the Otus, however, is in transmission and distortion. Depending on your own criteria as to what’s important in a lens, that may not be a compelling advantage, but when viewed as a whole, the Sony is nonetheless an impressive performer. 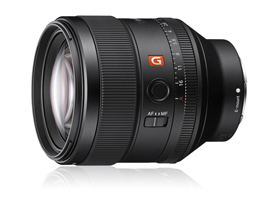 After the somewhat mixed results for the Sony FE 24-70mm f2.8 GM on the A7R, the second lens in the company’s new GM series, the FE 85mm f1.4 GM, has achieved a much more convincing performance, albeit on the latest-generation Sony A7R II with its new 42-Mpix sensor. Indeed, on the newer Sony body, the 85mm f1.4 is rated at a level similar to the Zeiss Otus 85mm f1.4 (on a 36-Mpix Nikon D810), which lens is considered the benchmark in today’s optics for full-frame cameras. The Batis remains an option, given its competitive price and performance, but that takes nothing away from the outstanding performance of the Sony FE 85mm f1.4 GM.